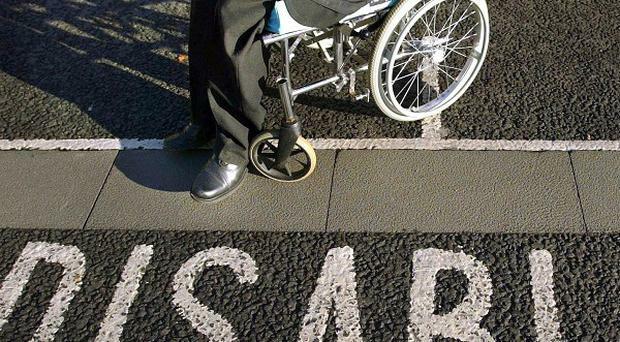 Questions have been raised over why a fifth of people in West Belfast are still drawing Disability Living Allowance. The area continues to have a higher proportion of claimants than anywhere else in Northern Ireland. Latest figures show 18,760 of the area's 94,200 population receive the taxpayer-funded hand-out. West Belfast also has one of the highest rates of people on jobseeker's allowance and income support. The figures were disclosed by Social Development Minister Mervyn Storey. Traditionally West Belfast's high dependency on benefits has been linked to the legacy of the Troubles. However, DUP MP Gregory Campbell argued that 21 years on from the first IRA ceasefire, that was no longer a valid reason. "The figure should not be as high as it is all these years later," he said. Details of disability benefit claims in various areas were disclosed following an Assembly question from Mr Campbell. He asked for a breakdown of those in receipt of DLA by Westminster constituency, and how that compared to each area's population. According to Mr Storey's answer, 19.9% of people in West Belfast are claiming DLA. That is more than double the lowest area, North Down, where just 7.6% of people are drawing DLA. Other high-claiming areas include North Belfast (15.6%) and West Tyrone (15%). Mr Campbell said he believed the proportion could be even higher because the population figures quoted in the answer include some who may not be eligible to claim DLA. The East Londonderry MP added: "I am absolutely certain that the figures that are at the top end of the scale are worse than is contained in the answer." Mr Campbell said the move towards peace raised questions about West Belfast's continued high dependency on handouts. "The issue about there being a higher proportion due to the Troubles was a very strong argument in the 1980s, the 1990s and even to some extent into the early 2000s," he added. "But when you look at the numbers of people that were killed or traumatised as a result of terrorism, the bulk of that happened in the early stages of the Troubles, in the 1970s and early 1980s. "The final 10 years of the violence brought relatively fewer killings and bomb attacks, and therefore one would assume fewer people traumatised to the point that they were applying for DLA." Mr Campbell said it was concerning that so many are still dependent on disability benefits. "I want to make the distinction between the many thousands who are perfectly legitimate claimants and are entitled to Disability Living Allowance," he added. "However, it would appear from these figures that there are people in some areas who are able to claim DLA long after you would assume they were no longer entitled to it." A separate Assembly question from Alex Attwood showed 4,080 people in West Belfast claim Jobseeker's Allowance - the second highest proportion of all 18 constituencies. West Belfast also has the highest proportion of people on income support. Sinn Fein's Paul Maskey, who is MP for the area, said his party would continue to protect the most vulnerable in society. "The higher number of claimants in West Belfast is a legacy of 30 years of conflict with the mental and physical anguish that arose from it," he said. "It is also an area that has suffered decades of discrimination, neglect and deliberate underinvestment. "These people are entitled to these benefits because they are suffering from a disability."